Photo 23. Looking south from above the small village of Llysfaen, just inland from Colwyn Bay and Llandulas, on the North Wales coast. 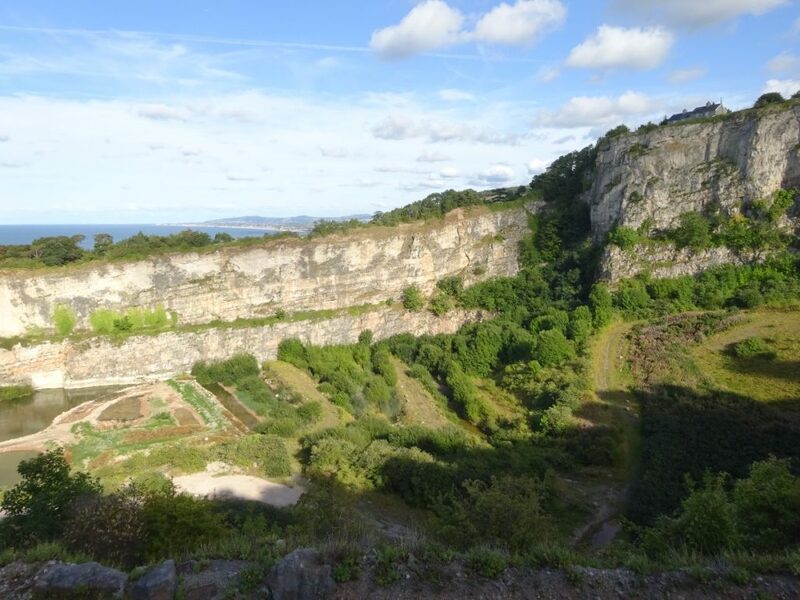 The 180 degree panorama clearly shows the typical, steep cliff line along much of the southern margin of the transgressive, shallow marine Lower Carboniferous limestone sequence. The valley below is composed of softer, ‘Basement Beds,’ at the base of the Carboniferous limestone series, which were deposited by fluvial channels at the sea/land margin. The hills further south, along the skyline, are the uplifted Silurian turbidites of the Denbigh Moors, which formed the Wales-Brabant landmass of central Wales during Carboniferous times. 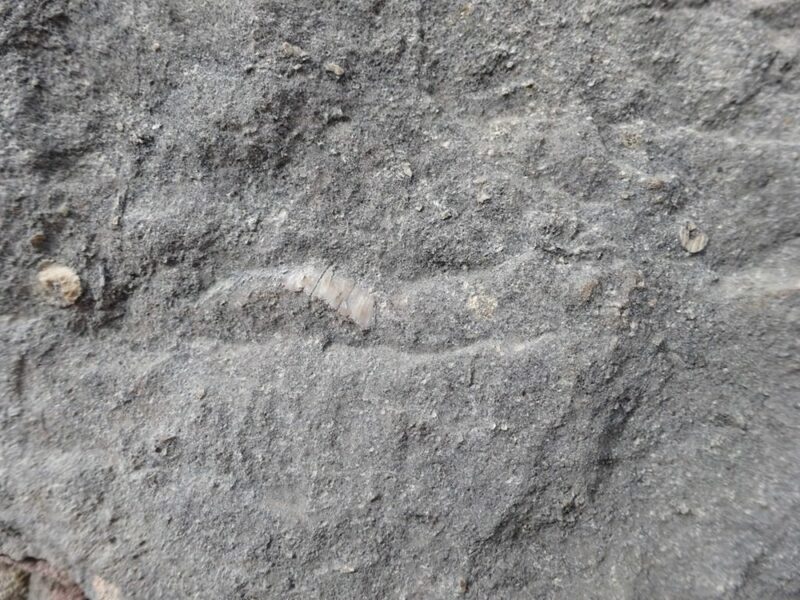 They were probably the source of the conglomerate pebbles found in the lowermost Basement Beds of the Carboniferous rock sequence. Photo 24. Relatively coarse grained, sandy limestones found in the limestone cliffs of Llysfaen, seen above. Circular fragments of crinoid ossicles at left and right, and a probable brachiopod shell fragment, centre, suggest high energy shallow water conditions prevailed at the time of deposition here. Photo 25. Just to the north of Llysfaen, on the coast near Colwyn Bay, large limestone quarries show spectacular sections through the Lower Carboniferous limestone sequence. The units dip northwards here. Some of this dip is probably tectonic, due to folding and uplift in the end Carboniferous Hercynian Orogeny, although some may also be syn-sedimentary dip northwards, off the shelf margin into deeper water.